Welcome! We are ideally located just 7 miles from Boston, and our accessibility to nearby bus, commuter train and subway transportation makes us an ideal place for business travelers and vacationers. Free on-site parking - no Boston driving and parking to deal with! 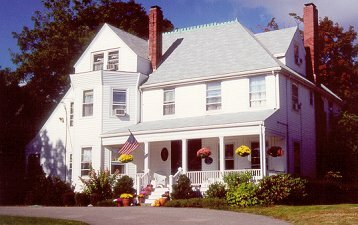 For a virtual tour of this lovingly restored historic home please visit www.gabracketthouse.com. Four spacious guest rooms plus a Corporate Suite all have private baths. 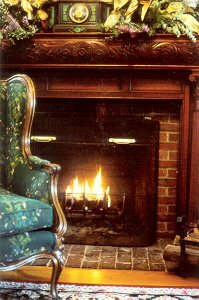 Common areas include a grand living room with fireplace, library and TV/VCR; a guest pantry and a peaceful solarium. Enjoy a glass of wine or a candlelight dinner on the new placita, a unique outdoor southwestern-style room with open fireplace tucked in a wooded corner. Rates: Vary with the season. Room rates: $120-160. Suite rates: $195-235. Long-term rates available. Subject to change without notice. Directions: Rte 128-95 Exit 29A to Rte 2 East Exit 59 to Rte 60 (Pleasant Street-Arlington Center). 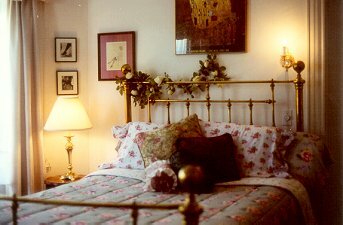 This and other Massachusetts Bed and Breakfast Inns can be found here in The Register.